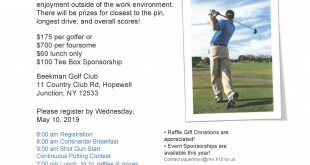 Wednesday, May 22, 2019, 9 am at the Beekman Golf Club Download and print event registration form. Contact Pete Quartironi for more information. The Mid-Hudson Chapter will be holding our monthly chapter meeting on Thursday, March 21, 2019 at the Ramada Newburgh/West Point, 1289 Route 300, Newburgh, NY 12550. General session starts at 11:00 am. Associate Members (Vendors) are welcome at 12 pm. Lunch will be served immediately after the general session! Northeast Region Climate Ctr Cornell Univ.